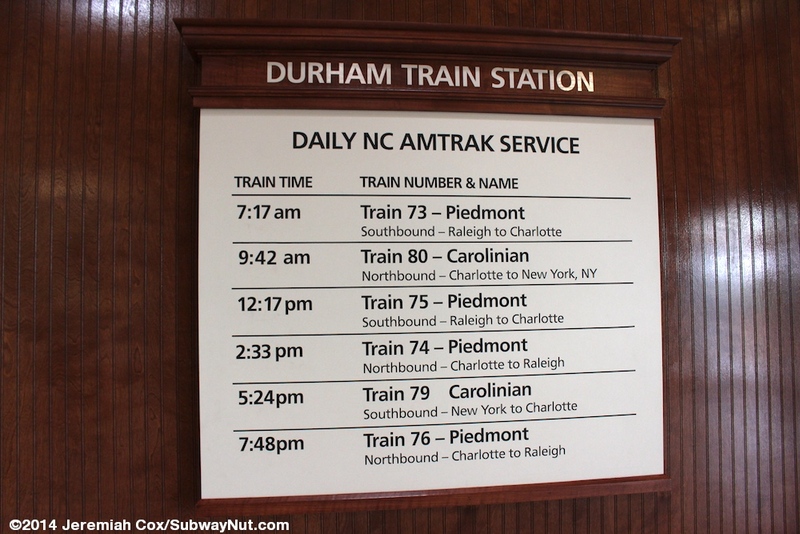 Durham received train service in the Amtrak area starting on May 12, 1990 when North Carolina began sponsoring the Carolinian to restore service on the corridor between Raleigh and Greensboro (the train operates concurrently with other routes along the rest of its route between Charlotte and New York). 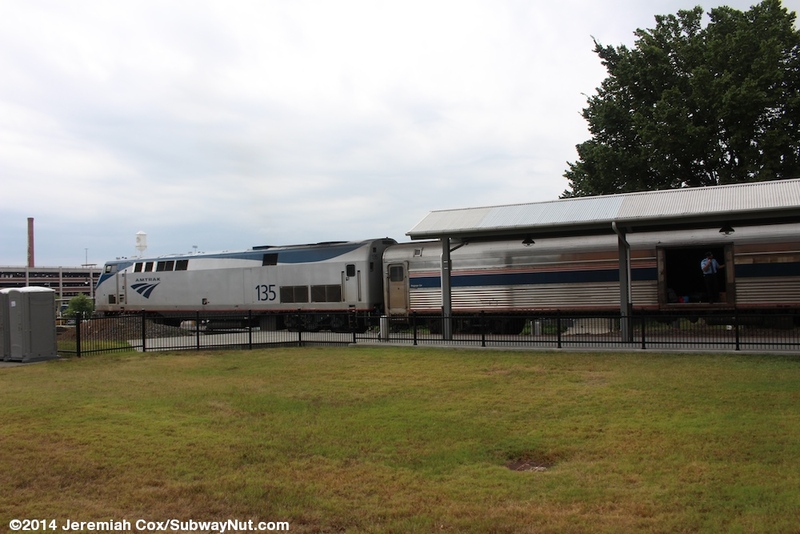 Originally the station consisted of only a platform. 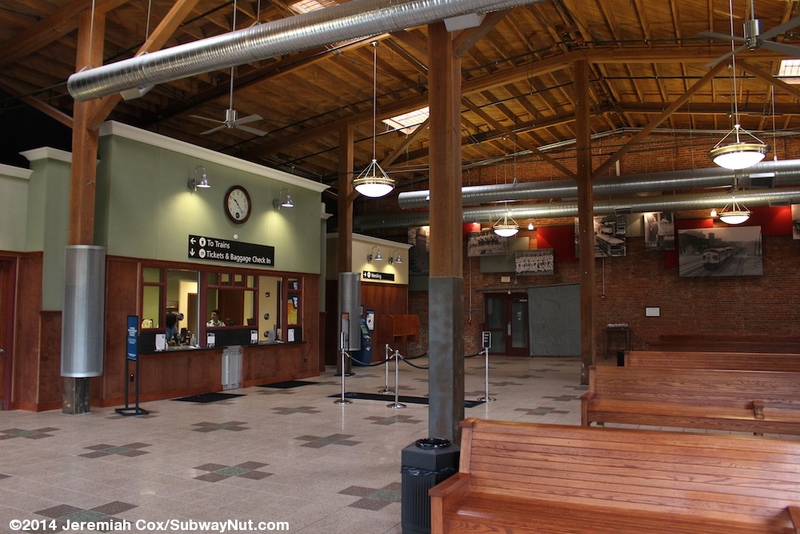 Ticketing and checked baggage service started in 1996 when an interim modular building was built for the platform that was located on the south side of the tracks, across from today's station and platforms. The concrete and sidewalk pad of this building is visible along with some wooden structures that are missing what where the signs along the now fenced off and covered in ballast former short platform. 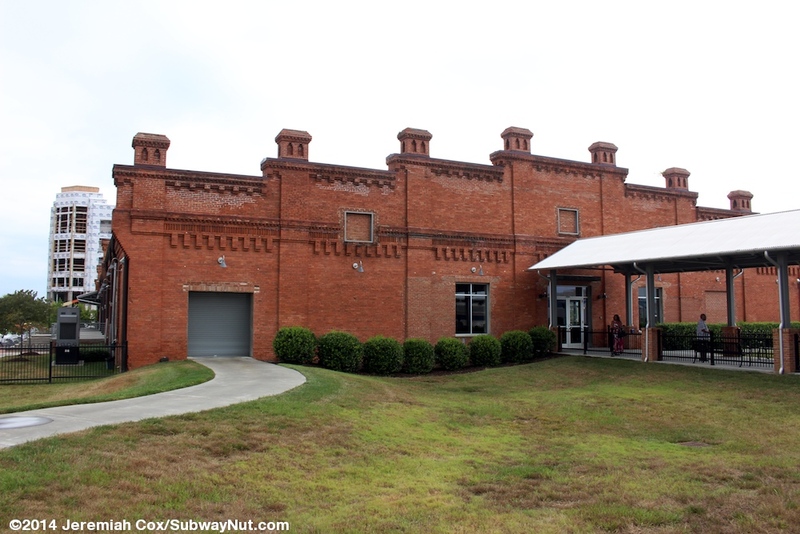 On July 10, 2009 Durham received a proper station when current station opened in a wing of the historic 1897 Ligget & Meyers Tobacco Company Walker Warehouse. 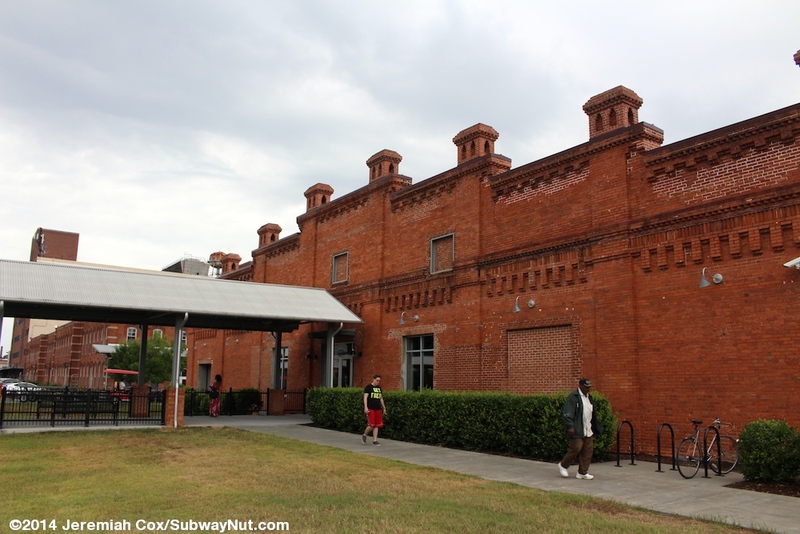 This building is a made of brick with unique chimneys along the sidewalls that are clearly visible from the station platform. Inside is a cavernous but relatively dark waiting room; this is a real gem. 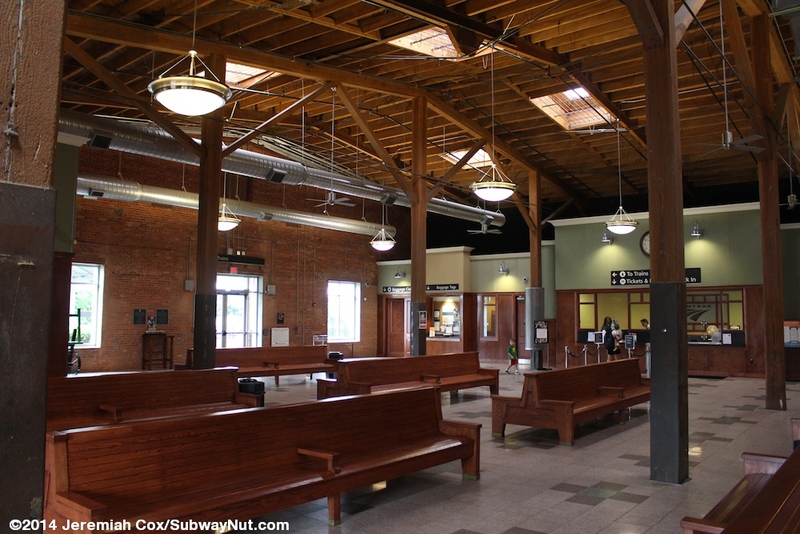 The walls are bricks, a wooden ceiling is held up by numerous columns. For waiting passengers are a series of wooden benches with arms. The Amtrak ticket windows & baggage check-in are along one wall with two agent windows and a single baggage opening in between them. The baggage claim is along this same west wall and consists of a door. 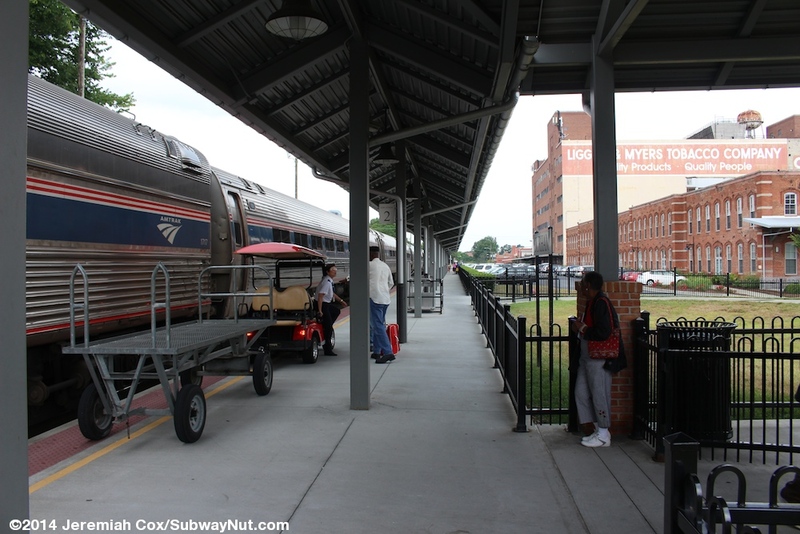 Along one wall is an artful display of historic photographs of transportation related images in Durham. 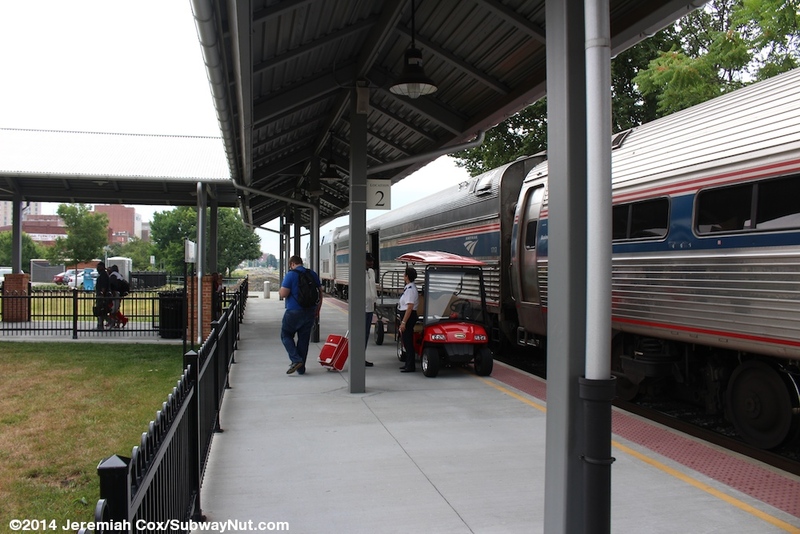 To reach the trains from the station house: a single door leads to a covered fenced in walkway (a path runs along the station house to the small parking lot on the SE side of the station, so arriving passengers don't have to go inside) that is 80 feet long, reaching the single platform for a single track at a gate. 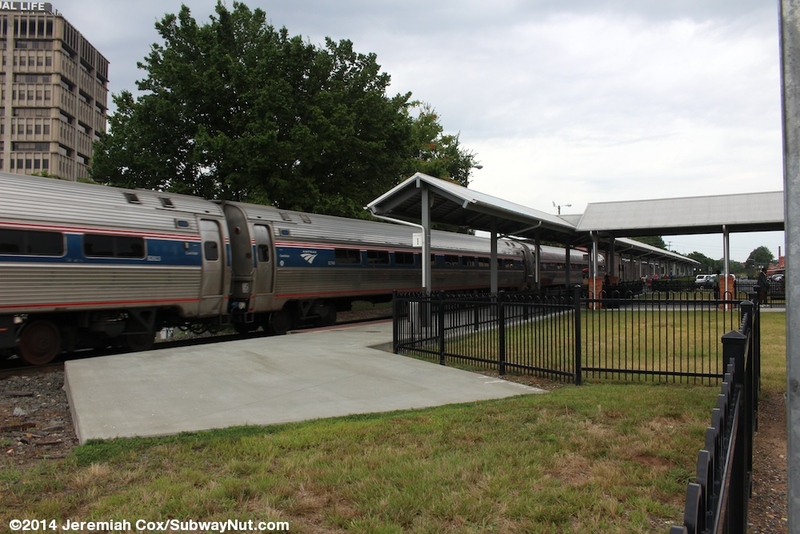 This gate (unlike those for platforms at other stations in North Carolina) was kept open by the station staff between train departures. 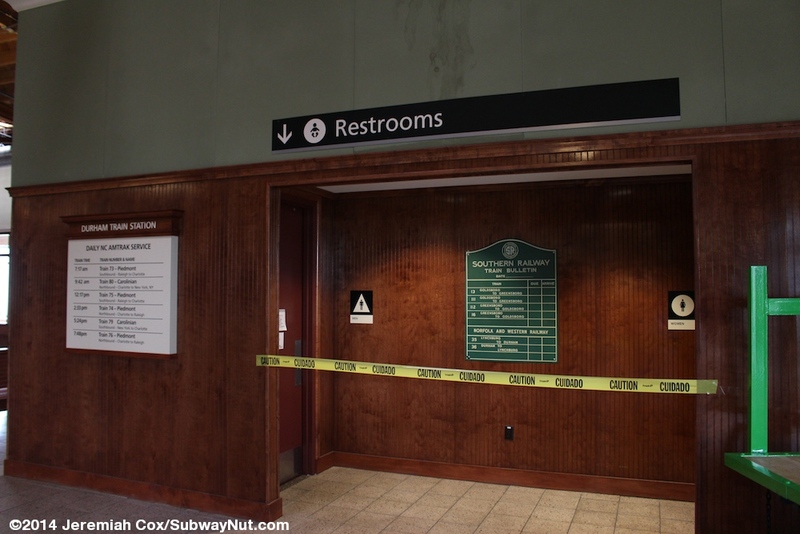 A second path (uncovered) is for baggage and is just west of here leading to a roll-up baggage door into the depot. 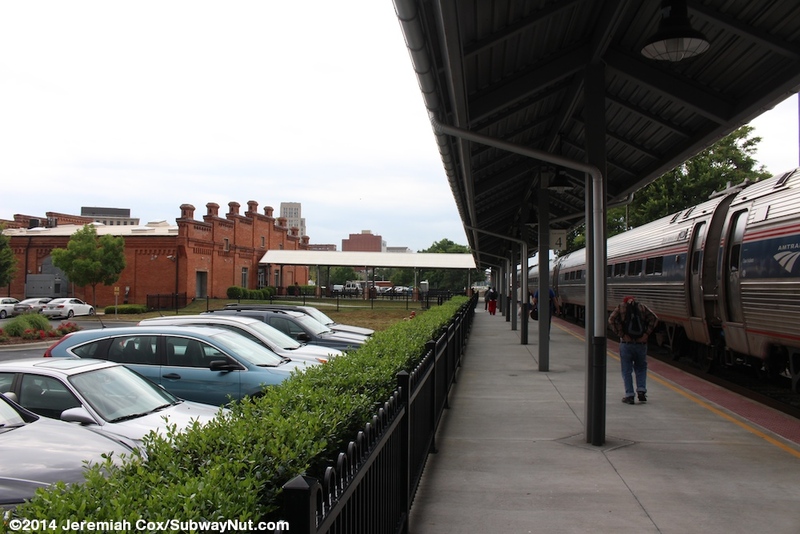 The platform itself is 600 feet long and begins at the underpass of Chapel Hill Street in front of the depot and extends NE (towards Charlotte actually because of the winding routing through the Research Triangle) ending a bit before the grade crossing with Duke Street, the end of the platform is just a series of silver bollards along the slightly wider area for the baggage cart to turnaround. 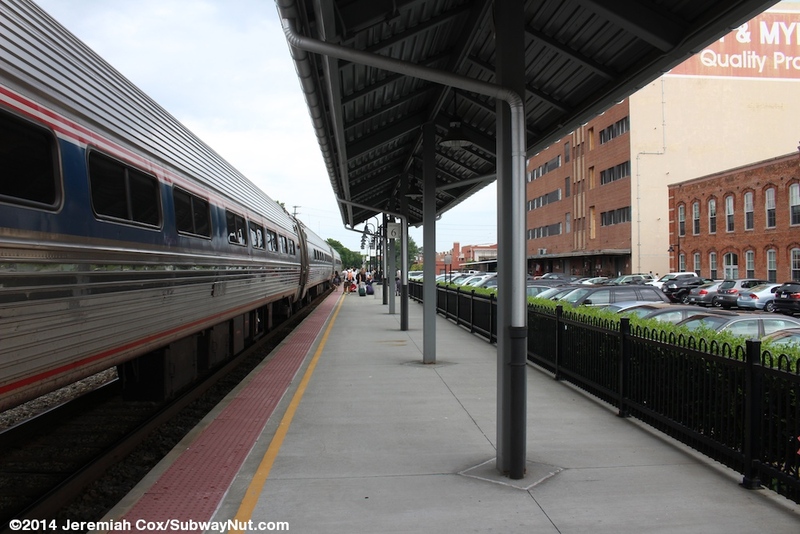 The entire platform except its last 150 feet is covered by a modern metal canopy painted grey. The end of the platform has a number of black lampposts. 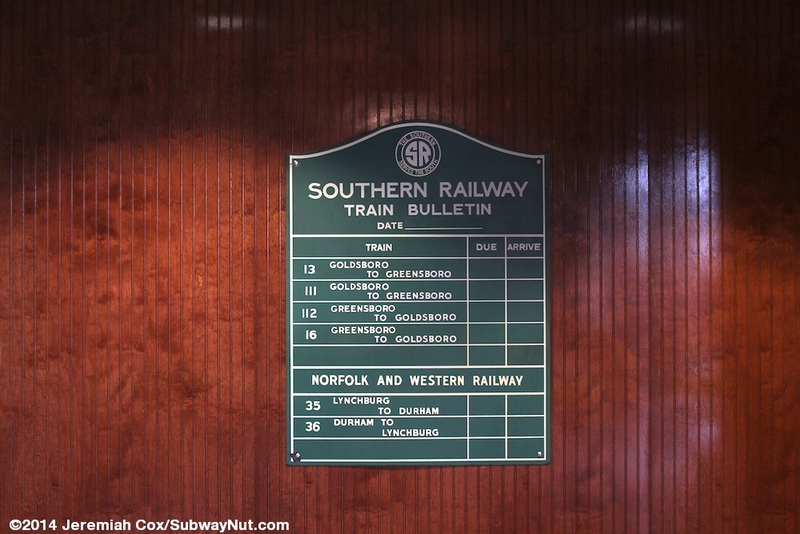 A series of 8 Location signs are on the platform. 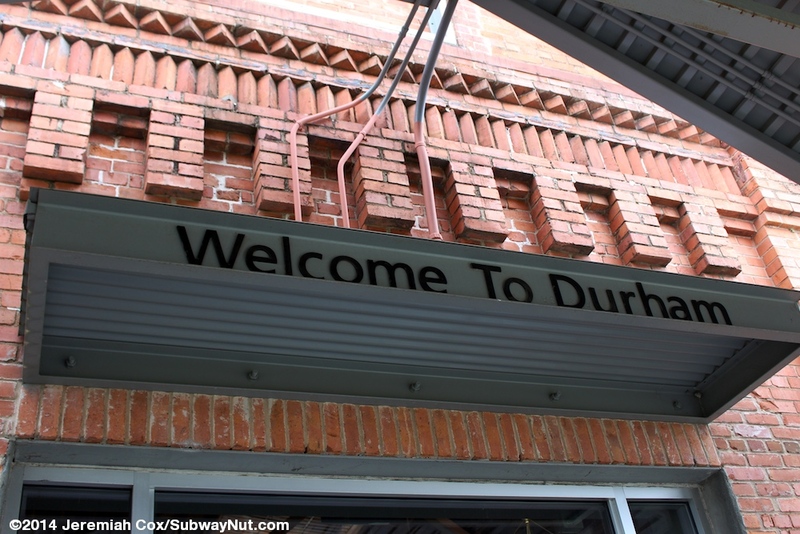 Just one station sign says Durham with a black text on white sign. Streetside of the station house doors lead out to the main Amtrak parking lot, and to a private parking lot on the otherside of the warehouse turned station. 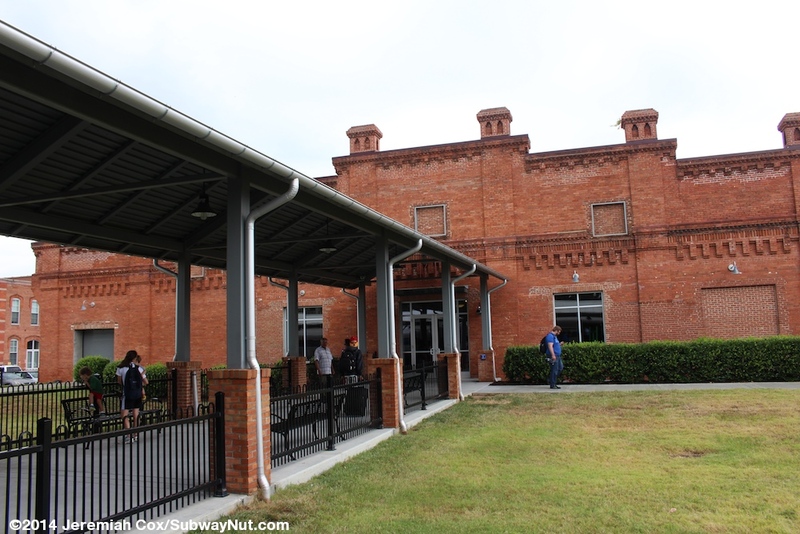 The parking lot runs the length of the warehouse building between it and a spur train track that intersects the railway just beyond the station. This parking lot with only 37 spaces lead back along the warehouse, whose edge is opposite the station on Main Street. 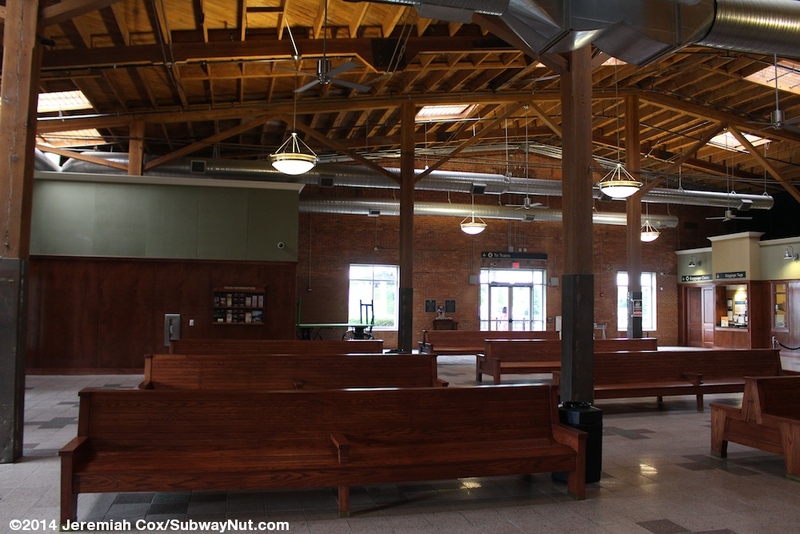 Other tenants are in the same former warehouse as Amtrak including some offices and a billiards hall. 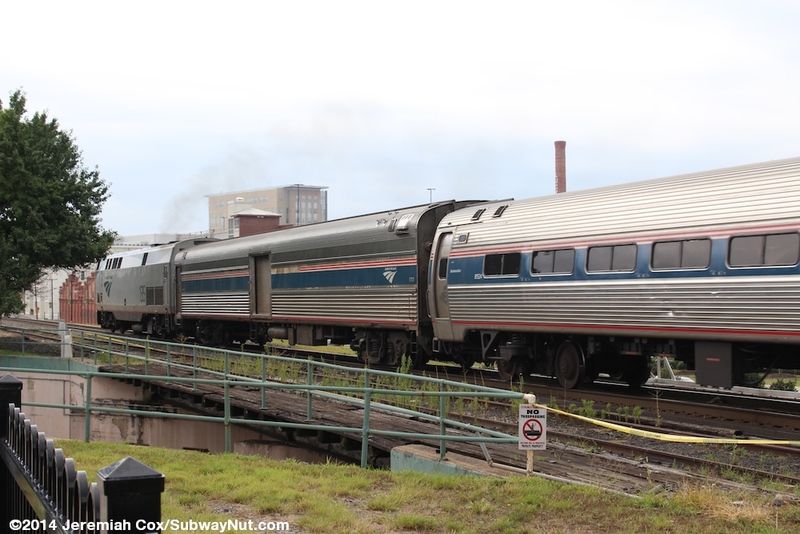 Some of these tenants have "This is Not the Amtrak Station" signs in their windows. 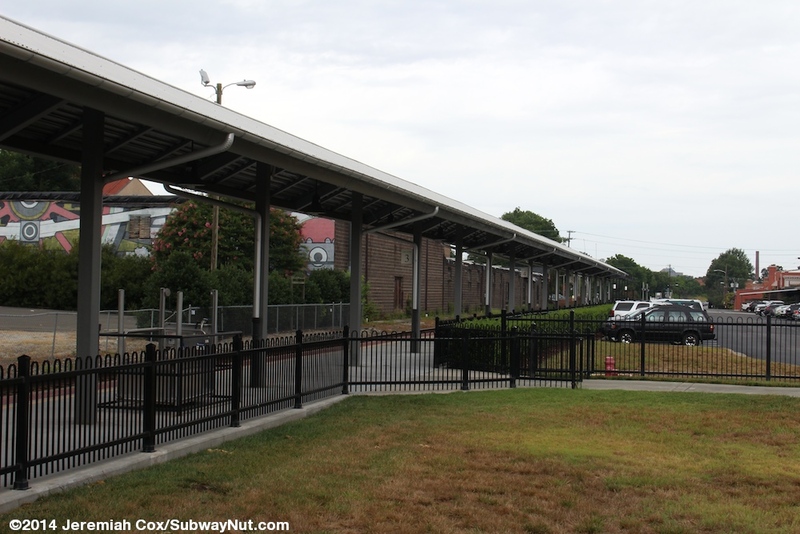 Across the tracks from the station (use the underpass of Chapel Hill Street) is the modern Durham Station also opened in 2009. 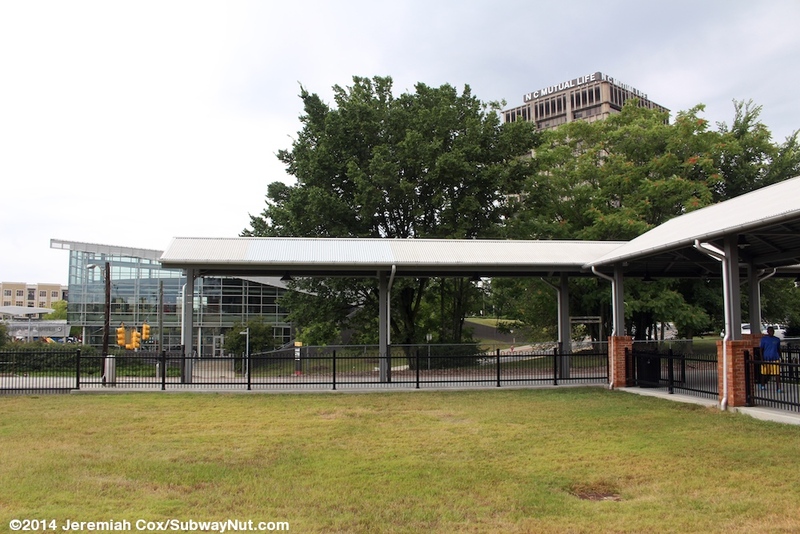 This modern silver 'station' is the main bus hub and pulse point for DATA (the Durham Area Transit Authority), and Triangle Transit Regional & Express Routes to Raleigh and Chapel Hill. The local buses all share a central island. Greyhound also stops inside and MegaBus stops outside this major bus hub.